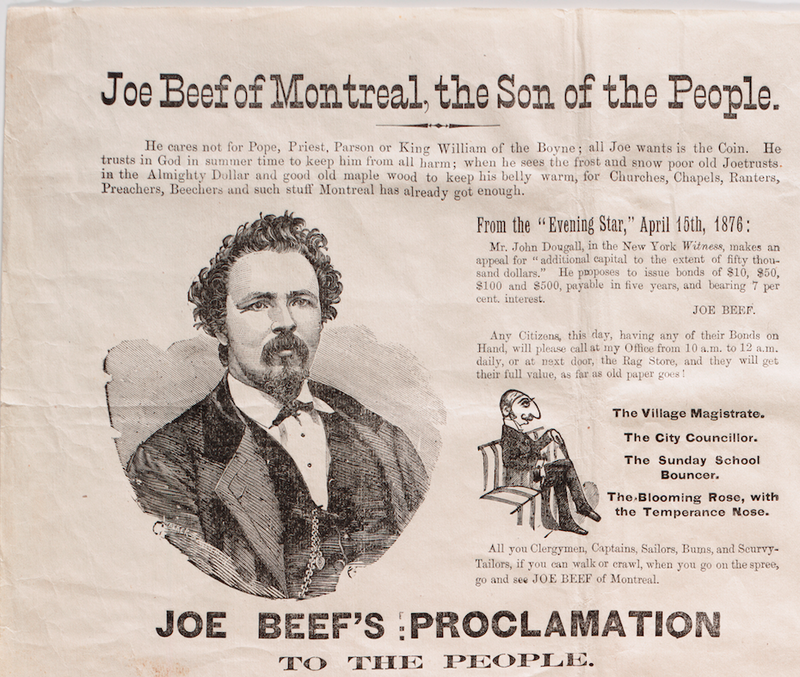 The original ‘Joe Beef of Montreal, the Son of the People‘ manifesto was printed on woven paper in 3 columns; includes 13 illustrations and text. The original measures over 103 x 69 cm so below we’ve zoomed in to just the top left hand corner to give you an idea of the level of detail in the illustration. You can see the full image online here. Issued by Charles McKiernan, nicknamed Joe Beef, the proprietor of Joe Beef’s Canteen in Montreal, at a time when he was defending himself against a campaign to discredit him led by John Redpath Dougall, owner of the Montreal Daily witness, who deplored the sale of alcohol at the Canteen, although this helped raise money for McKiernan’s extensive charitable work. 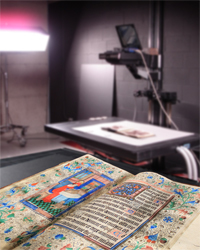 To see the original you can visit Rare Books and Special Collections during their opening hours, Monday-Friday 10am-6pm. Close up of ‘Joe Beef of Montreal, the Son of the People’ manifesto.He cares not for Pope, Priest, Parson or King William of the Boyne; all Joe wants is the Coin. He trusts in God in summer time to keep him from all harm; when he sees the frost and snow poor old Joe trusts in the Almighty Dollar and good old maple wood to keep his belly warm, for Churches, Chaples, Ranters, Preachers, Beechers and such stuff Montreal has already got enough. This entry was posted in Montreal matters, Rare Books and Special Collections and tagged Montreal History, Montréal (Québec) -- Social conditions -- 19th century. by Sarah Severson. Bookmark the permalink.